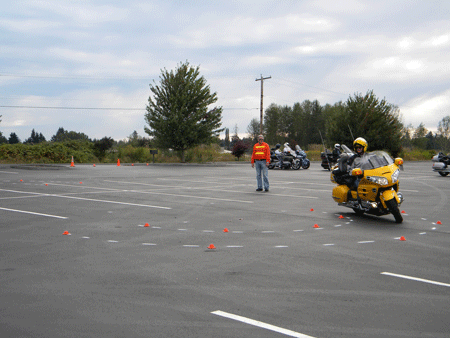 I try to take a motorcycle riding improvement course every 3-5 years. 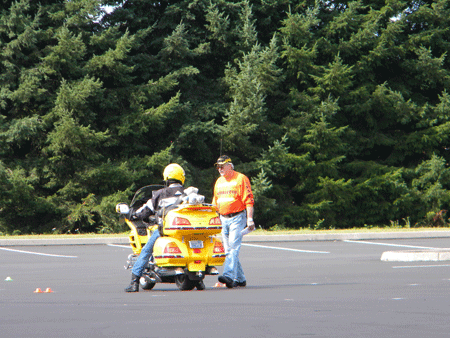 I had not had one since we left for Europe in 2006 and when the ARC (Advanced Rider Course) was put on by the GWRRA (GoldWing Road Riders Association) in Buckley, WA, I signed up. Buckley is a small town about 2 and a half hours north on I-5 freeway from our house. As the class started at 8:00 in the morning we were going to have to leave at about 5:00 and wouldn't get back until about 8 that evening. The weather was supposed to be good for late September and we decided to make it the last camping trip of this year. We would take two days to get to Buckley by going on the east side of Mt St. Helens on the US Forest Service Road #25 and then the east side of Mt. Rainier on state highways. Along the way we would visit Windy Ridge, the nearest point to the crater of Mt. St. Helens you can drive to. 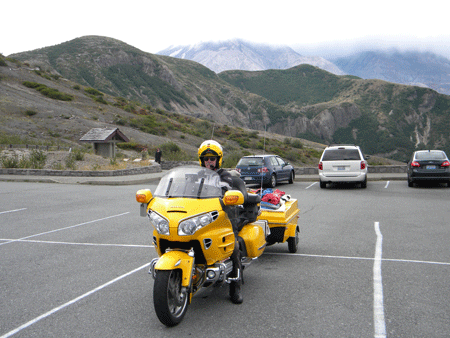 (See this page for my ride up the west side to the Johnston Ridge Visitor Center with friends from Australia.) And we would also go to Sunrise Lodge on Mt. Rainier. The 25 road is a paved, mostly 2-lane road that was spared when Mt. 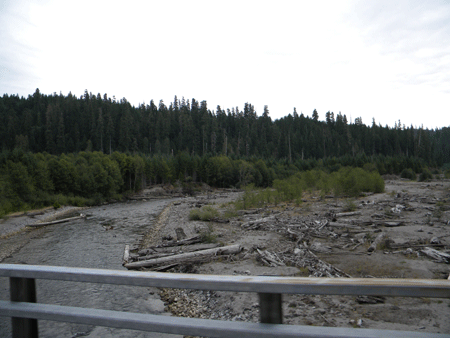 St. Helens blew it's top in 1980, but the streams that flow down the mountain still show the effects of the mud flows and killed trees that were washed down the mountain. The road is poorly maintained and has lots of places where the pavement has cracked and dropped several inches because of unstable soils underneath the road. These made for an interesting ride. I spent a lot of time in the oncoming lane dodging the bad sections. Thank goodness this is a little used road, hence the poor maintenance by the USFS. The 25 road runs north from near the town of Cougar to the town of Randle going along the east side of Mt. St, Helens. Off of it is a dead-end road that leads to Windy Ridge, a major viewpoint that looks right into the crater. The mountain was shrouded in clouds by the time we got there. It is the light colored background in the picture. The new lava dome that has been forming is right over the green hill just right of the center of the picture. The Windy Ridge road does go through the blast zone. 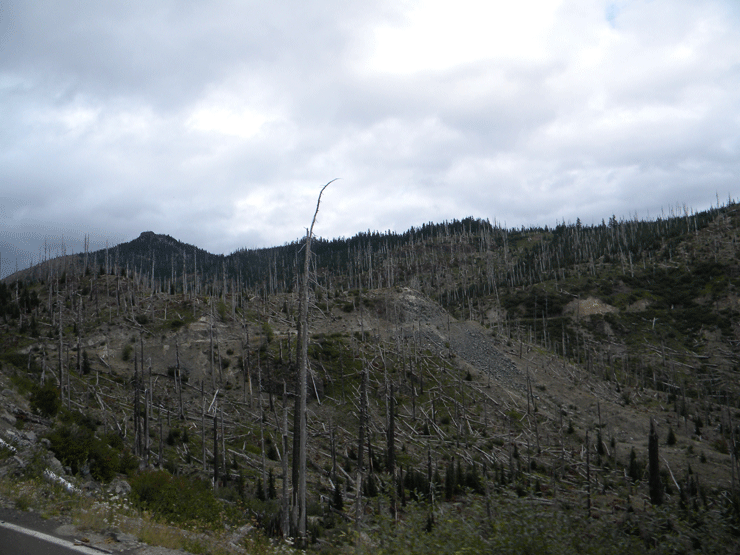 In the picture below you can see trees that were laid pointing away from the mountain and others that were big enough or far away enough that they were just killed. The hot ash and steam that blew across this landscape happened in just seconds. But today, 31 years later, you can see that Mother Nature is rebuilding her forest here. These are all naturally regenerated trees. There has been no planting by humans within the National Monument. 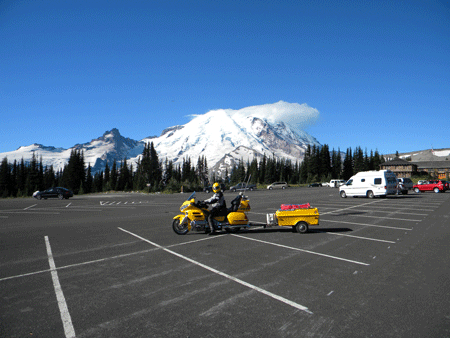 We travelled on to the entrance of Mt Rainier National Park and spent the night in a USFS campground. Then the next day we were on our way to Sunrise Lodge in the Park. The road was much better, but then it is a state highway with a much heavier traffic load than the 25 Road. There were scenic turnouts and lots of trees but our destination is Sunrise Lodge with this jaw-dropping view of the mountain. Mt. Rainier does not have a crater but it is a volcano. It is the one that is pictured on our license plates and is shown by the television stations when they have a half-time break in a football game in Seattle. It is easily visible from the stadium. 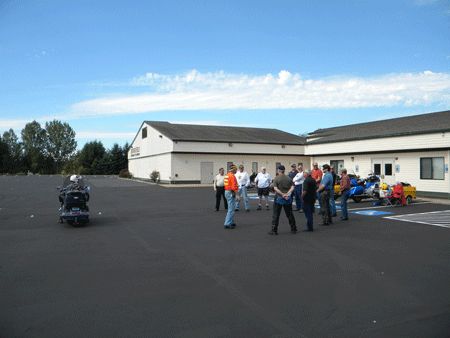 From here we rode on to Buckley and spent the night in the backyard of a very nice GoldWing couple, Tim and Judy. 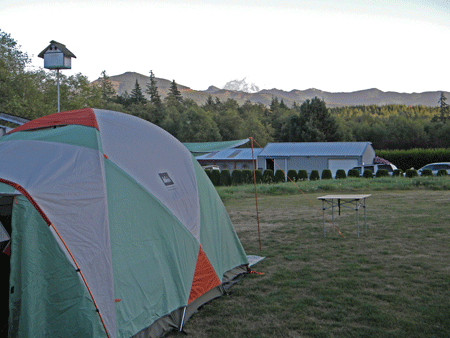 When we had looked for campgrounds in the Buckley area the only thing that came up was the local fairgrounds. Fairgrounds are not generally good tent campgrounds so I got out our club's Gold Book which lists members willing to help out others by having a place for them to stay. Our "campsite" had a view of Mt. Rainier peeking over the ridge in the distance. Then it was up early and on to the Advanced Rider Class. As is standard we started with a classroom session that lasted about three hours. During this time we filled out several sheets of paper absolving the sponsor from any liability for our actions. 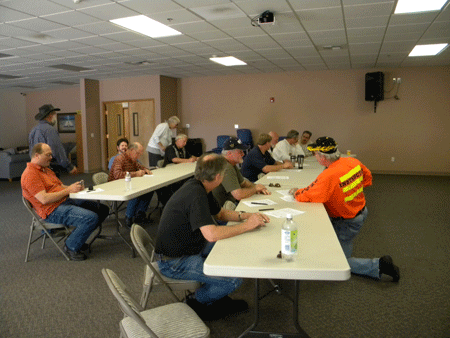 We discussed traffic conditions, road conditions, rider conditions, weather conditions, motorcycle conditions, motorcycle maintenance, rider maintenance, and others. After a break for lunch we went outside to the large parking lot and got ready. We had two instructors, Randy and Randy. I never got their last names. First was a discussion of the upcoming exercise and what it was supposed to accomplish in rider improvement. Then one instructor demonstrated the exercise while the other talked us through it. Then we would line up and run through it ourselves. 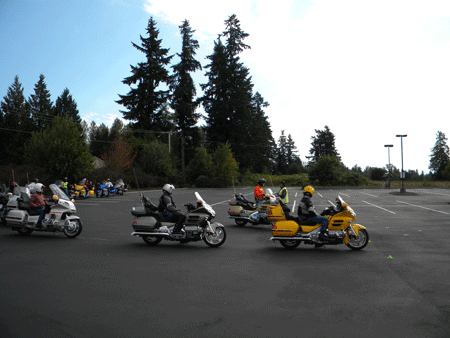 Each exercise was performed multiple times until the instructors felt that we all were performing it well. Comments were honest, whether corrective or complimentary and presented in a constructive manner. 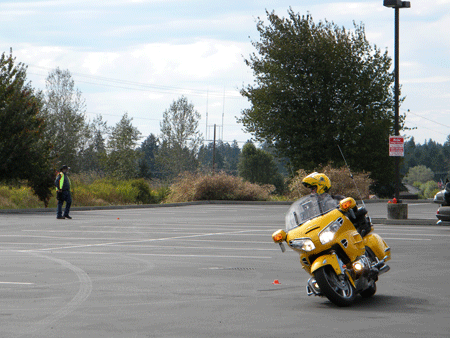 We had stopping practice, see above and turning practice going around cones set 50 feet apart, see left. We also had stopping while turning practice. 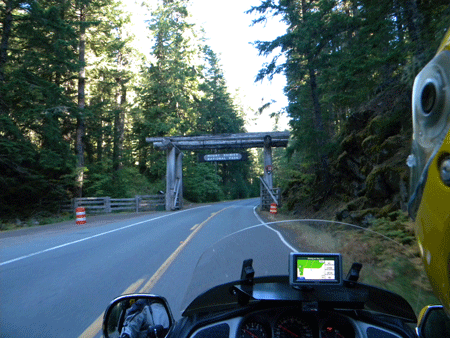 We rode through narrow lanes between rows of cones set in a sharp curve, see below. Be sure and use your "BACK" button to return to this page!!! 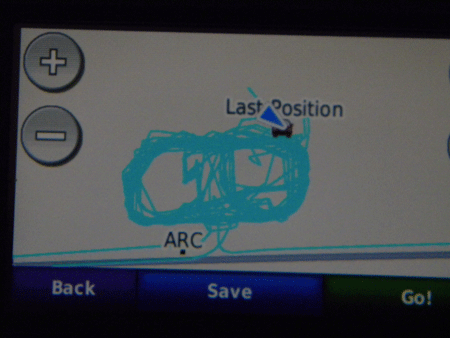 This is the GPS track I had when the class was only half over. It was an even bigger mess when we were done! Finally it was over. 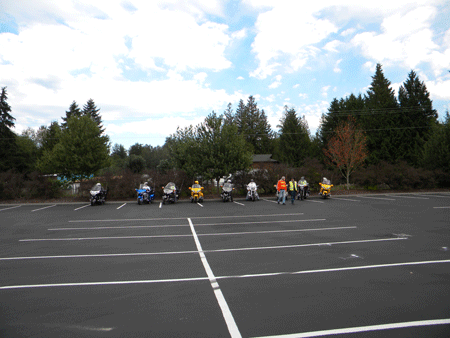 We parked the bikes and returned to the classroom. It had been a fun five hours, but tiring. We critiqued the class and got our certification cards and parted ways. We got home at 8 PM and collapsed. We didn't even start unpacking the trailer until the next day. Many thanks to Randy and Randy for the class. I got some of my bad habits corrected. Now it is up to me to continue practicing the right way to do it. And many thanks to Tim and Judy for the campsite and bathroom.